As is being widely reported this morning, Apple and Samsung have agreed to settle all of their ongoing patent disputes outside of the US. This means that the Australian proceedings, which have occupied, by my estimate, over 150 days of court time, and the attention of two Federal Court judges, will now be terminated, presumably without judgment. The only thing that is surprising about this is just how freakin' long it took! I hate to say I told you so (actually, I don't), but I kind of did tell you so, way back at the beginning of August 2011, when Apple first commenced its Australian litigation against Samsung. I made four predictions on day one, and was more right than wrong in everything but the time frame. In my defence, the duration and scope of the case was completely unprecedented, and the assumption that Apple and Samsung would reach a rational commercial resolution failed to take into account the intransigence and emotional investment of the late Steve Jobs. Here, briefly, are those four predictions, and an assessment of how they stack up against the outcome. 1. 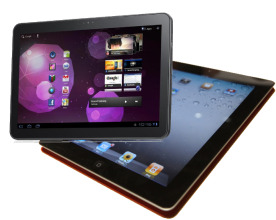 That Samsung would launch the Galaxy Tab 10.1 on the Australian market shortly after complying with an agreement to supply samples to Apple. Samsung had agreed to delay the launch of its original Galaxy Tab in Australia briefly, to give Apple time to evaluate samples. Under that original agreement, Samsung would have been entitled to launch seven days after supplying the samples, but it subsequently agreed to a further delay to enable Apple's application for an interlocutory injunction to be heard and decided. 2. That Apple may seek an interlocutory injunction, but would not get one. I had good reasons for thinking that Apple did not have a strong case for an interlocutory injunction to be granted. However, initially Justice Annabelle Bennett saw things differently. To be fair, she did have the benefit of seeing all of the parties' evidence, and considering their arguments, and of course the whole purpose of court hearings to for the litigants to try to persuade the judge to decide in their favour. In the end, however, a Full Bench of the Federal Court decided that Justice Bennett got it wrong, and that Apple was not entitled to a preliminary injunction. The High Court saw no fault in the full court decision. The Galaxy Tab 10.1 was finally launched in Australia just barely in time for Christmas 2011. 3. If the case were to proceed beyond the preliminary stages, it would run for at least two years, with Galaxy Tabs and iPads in various revisions continuing to sell like hotcakes. It has been almost exactly three years since I wrote this. Actually, I considerably underestimated the duration of the proceedings. I had assumed perhaps a few weeks of hearings before a single judge, followed by a judgment, followed by at least one appeal. In the event, the hearings lasted for months, spread over more than two years, were heard by two separate judges, and we do not have even a single decision on the merits of either party's case. If Apple and Samsung had not settled, the process for which I had allowed (i.e. including appeals) would probably have run for five years or more. It is also fair to say that, for most of this time, Samsung's tablets have not, in fact, been selling like hotcakes. It is only recently that Android-based devices have started to take a significant share of the tablet market from Apple's iPads. But perhaps that is the point. The drawn-out litigation has allowed a number of generations of devices to be developed and launched, and given the market time to mature. Had Apple actually succeeded in keeping Samsung products off the shelves, perhaps things would be very different today. 4. That long before any resolution in the Australian case, Samsung and Apple will settle all of their suits on a worldwide basis. As I said above, there is no accounting for irrational decision-making. In the event, the parties became so entrenched in their disputes that it became difficult for them to extricate themselves. Certainly (accounting for appeals) we are still far from any final resolution in the Australian litigation. But at this stage, the settlement excludes the US. In fact, this should probably not really be regarded as a settlement. The reality is that Apple and Samsung have not fully resolved their disputes and, for example, no payment or cross-licensing arrangement appears to have been reached. No doubt this is the reason for continuation of the proceedings in the US, which gives both parties continuing leverage in the largest single market in which they have been battling, while allowing them to stop spending huge sums of money on largely pointless litigation elsewhere. One thing that this agreement does leave me wondering is whether Justices Bennett and Nicholas, who have devoted so much of their working lives to this dispute over the past three years, will be feeling relieved that they no longer have to produce coherent judgments based on hundreds of hours of testimony and thousands of pages of evidence, or infuriated by the ultimate futility of this consumption of a huge quantity of the court's resources and their own time. To conclude the proceedings, Apple and Samsung will need to ask the court to issue orders by consent. This does not necessarily call for an appearance, but in this case I expect there will be one, and the court could take the opportunity to rebuke the parties for not seeing sense sooner. We shall see. Update, 11:57am AEST: The applications in the main proceedings were all discontinued on 6 August 2014. Two ancillary matters (relating to whether certain Apple patents were properly granted) also involving the Commissioner of Patents remain open. It is not clear to me whether these applications can be withdrawn without consent from the Commissioner. Even if Apple and Samsung no longer have any interest in pursuing the matter, there remains a potential public interest in determining whether or not the practice of the Commissioner in these cases is correct or not. I will keep an eye on them to see what happens. ‘Software Patents’ – Time to End the Uncertainty! What is the Starting Point for Inventive Step?